NEW BRITAIN - The New Britain Bees scored in each of the first three innings on Sunday, but so did the visiting Somerset Patriots - who went on to plate runs in each of the first five innings to take a 9-3 lead on their way to a 9-6 victory at New Britain Stadium. 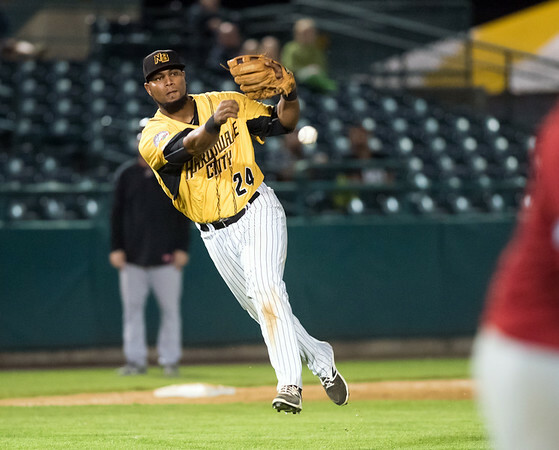 Somerset swept the three-game series, putting themselves in contention in the second half divisional race, while the Bees’ postseason hopes continue to fade as they suffered their fourth straight loss. New Britain’s Deibinson Romero went 2-for-3 with a home run and two RBI in the game, while Jovan Rosa was also 2-for-3 with two RBI and a run scored. But Bees starting pitcher Sam Gervacio gave up five earned runs on seven hits and a walk over the first two innings as Somerset built the early lead. Reliever Matt Quintana gave up four earned runs on five hits and three walks over the next three innings before four other New Britain relievers - Jim Fuller, Chris Reed, Brandon Cunniff and Evan Scribner - each pitched a scoreless inning to close out the game. Craig Massey homered for the Patriots, going 3-for-5 with two runs and two RBI. Ramon Flores also went 3-for-5 for Somerset, with a run and two RBI. Duane Below picked up the win, going 5 2/3 innings, allowing three earned runs on six hits and a walk, while striking out six batters. Posted in New Britain Herald, New Britain Bees on Sunday, 2 September 2018 21:08. Updated: Sunday, 2 September 2018 21:11.